The Foundation & Formation Series is a complete six-year scope and sequence Bible Study strategy. That's right. Secure 6-years at once and you'll be on your way to building a solid Bible Study strategy in your ministry. Plus, never pay again. It's once and you're done. Use the Foundation & Formation Series and lead your youth ministry on a journey of faith-development and an embracing of what it means to be a committed disciple of Jesus based on the powerful truths of God’s Word. BUDGET SAVER! The Foundation & Formation Series includes access for unlimited teachers within your church! NO SHIPPING! The Foundation & Formation Series is downloadable and available as soon as you purchase. Since 2010, YM360's Bible Study Curriculum has been taught to thousands of students weekly all over the globe. Our studies are widely known in youth ministry as some of the most Gospel-centered, Biblically deep, easy-to-teach, and student friendly lessons available. And budget friendly too at less than $6 per week for your entire 6 years! Help students understand the narrative of the Bible and how God has woven the truth of the Gospel through all of Scripture. Do you want to help students grasp the essential truths of their faith? Then the Foundation Studies will deliver. Over the course of these three years, your students will learn the big-picture story of the Bible as well as 25 core concepts of what it means to be a Christ-follower. The Foundation Studies lead your students on a journey of faith-development based on the powerful truths of God’s Word. 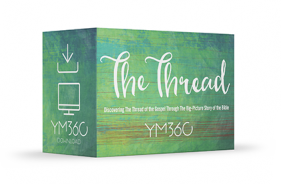 The Thread: Discovering the Thread of the Gospel Through the Big-Picture Story of the Bible provides 52-lessons that will help students understand the narrative of the Bible and how God has woven the truth of the Gospel through all of Scripture. Activate: The Building Blocks of Faith provides 52-lessons that'll equips students to lay the foundation of a lasting relationship with God through a study of the core concepts of their faith. Amplify: Growing A Faith That Lasts provides 52-lessons that encourage students to grow a dynamic faith by studying a variety of core spiritual truths. Do you want to see your students live out their faith in a way that impacts the world around them for the sake of the Gospel? Meet the Formation Studies. The Formation Studies immerse your students in the Gospel, teaching them who Jesus was, what He taught, and how He radically changed them and the world through His life, death, and resurrection. Your students will also be taught exactly what it looks like to live the life of a disciple. The Formation Studies equip your students with the knowledge they need to live bold lives for Christ. The Jesus Studies provides 52-lessons where students will explore Jesus’ teachings about the relevant issues of a teenager’s life, like identity, culture, relationships, influence, and more. The Rescue: Discovering How the Gospel Rescues and Redeems Us provides 52-lessons where students will learn what the Gospel is, how it changes them, and how God uses the Gospel, and them, to impact the world. The Life: Embracing the Life of a Christ-follower provides 52-lessons where your teenagers will learn exactly what it looks like to live a life of discipleship as committed followers of Jesus. • 6th-12th grades where you can mix and match between Junior and Senior High as needed. Our team is happy to help you think through how to best do this with these 6 years of studies. • 312 total lessons or 6 years of content designed to be your youth ministry Bible Study strategy. Download the sample pack for The Foundation & Formation Bible Study Series, a 6-year Bible study series, and get an up close look at Lesson Plans, Teacher Prep Videos, Parent Pages, Student Devotions, and Social Media Content!